We recommend that you have the oil change carried out by an Audi dealership / qualified workshop according to the intervals stated in the Service Schedule or according to the service interval display in the instrument cluster. Whether your vehicle is serviced at flexible service intervals or fixed service intervals is shown in the Service Schedule. The correct oil specifications for your engine are listed in the Technical data section, “Performance, weights and dimensions”. Check that the specifications quoted (VW standards) appear on the container either singly or in combination with other specifications. Special engine oils, “Performance, weights and dimensions” have been developed as part of the Audi LongLife Service (⇒ “Service Schedule”). This type of oil must be used if you intend to take advantage of the extended maintenance intervals allowed by the Audi LongLife Service. • Do not mix the LongLife oil with oil intended for fixed service intervals, as the requirements for the extended service intervals are then no longer guaranteed. • In exceptional circumstances, if the engine oil level is too lowgggggg 258 and you cannot obtain the specified LongLife oil, you can put in a small quantity of oil for fixed service intervals -, “Performance, weights and dimensions”. This should not be done more than once and no more than 0.5 litres should be used. If you do not take advantage of the LongLife service for your car, you can use the oils for fixed service intervals -, “Performance, weights and dimensions”. In this case, your car must be serviced after a fixed interval of 1 year / 15,000 km (9,000 miles) – see Service Schedule. • In exceptional circumstances, if the engine oil level is too low and you cannot obtain the oil specified for your vehicle, you can put in a small quantity of oil conforming to the specification ACEA A2 or ACEA A3 (petrol engines) or ACEA B3 or ACEA B4 (diesel engines). This should not be done more than once and no more than 0.5 litres should be used. The Service Schedule states whether your vehicle is fitted with a diesel particulate filter. • Vehicles with diesel particulate filter must only be filled with engine oil VW 507 00. This oil can be used regardless of whether the vehicle is serviced at flexible service intervals (Audi LongLife Service) or fixed service intervals. • Avoid mixing this oil with other engine oils. • In exceptional circumstances, if the engine oil level is too lowgggggg 258 and you cannot obtain the oil specified for your vehicle, you can put in a small quantity of oil conforming to the specification VW 506 00 / VW 506 01 or VW 505 00 / VW 505 01 or ACEA B3 / ACEA B4. This should not be done more than once and no more than 0.5 litres should be used. – Park your vehicle on a level surface. – Allow the warm engine to run briefly at idling speed and then switch off the ignition. – Wait approx. 2 minutes. – Pull out the dipstick. 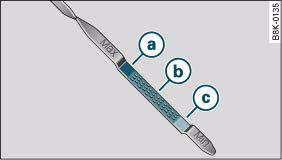 Wipe the dipstick with a clean cloth and insert it again, pushing it in as far as it will go. – Then pull the dipstick out again and check the oil level ⇒ fig. 253 or ⇒ fig. 254. If the oil level is too low, add more engine oil. – Do not top up oil. – Oil can be topped up. After topping up the oil level should be in area a. – Oil must be topped up. After topping up the oil level should be in area . Depending on how you drive and the conditions in which the car is used, oil consumption can be up to 0.5 ltr./1000 km. Oil consumption is likely to be higher for the first 5000 km. You should therefore check the oil level at regular intervals, ideally every time you fill the tank, and also before setting off on a long trip. You can check the engine oil level via the sound system or MMI*. – Select: Function selector button CAR > Oil level. – Read off the oil level on the display ⇒ fig. 255. Top up the engine oil if the bar in the oil level display is near the “min” mark. Depending on how you drive and the conditions in which the car is used, oil consumption can be up to 0.5 ltr./1000 km. Oil consumption is likely to be higher for the first 5000 km. The oil level display is intended solely for information purposes. An oil level warning will appear in the instrument cluster if the oil level is too low. Add more oil. If the bonnet has been opened, the current oil level will be shown in the instrument cluster the next time the ignition is switched on. – Unscrew cap e from oil filler opening ⇒ fig. 256. – Carefully put in the specified grade of oil 0.5 litres at a time. 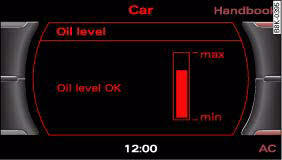 – Check the oil level again after two minutes by calling up the sound system or MMI* display or using the oil dipstick. – If the oil level is too low, add more engine oil. 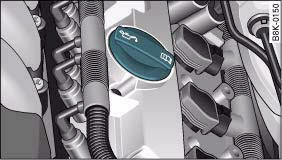 – Replace the oil filler cap carefully and push the dipstick all the way in (on vehicles with dipstick). • Ensure that no oil comes into contact with hot engine components when topping up: this could cause a fire. • Wash your skin thoroughly if it comes into contact with engine oil. • The oil level must never be above area a, fig. 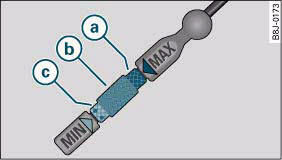 254, as this may result in damage to the catalytic converter or to the engine. On vehicles without an oil dipstick, you can check the oil level via the sound system or MMI*. Contact a qualified workshop to extract the engine oil if necessary. • No additives should be used with engine oil. Any damage caused by the use of such additives would not be covered by the factory warranty. • Never pour oil down drains or into the ground. • Always observe statutory requirements when disposing of empty oil canisters.